In 1883 George Eastman had just expanded his photographic dry plate mass production operation in Rochester, New York, and seemed to be in a strong position to dominate the market. 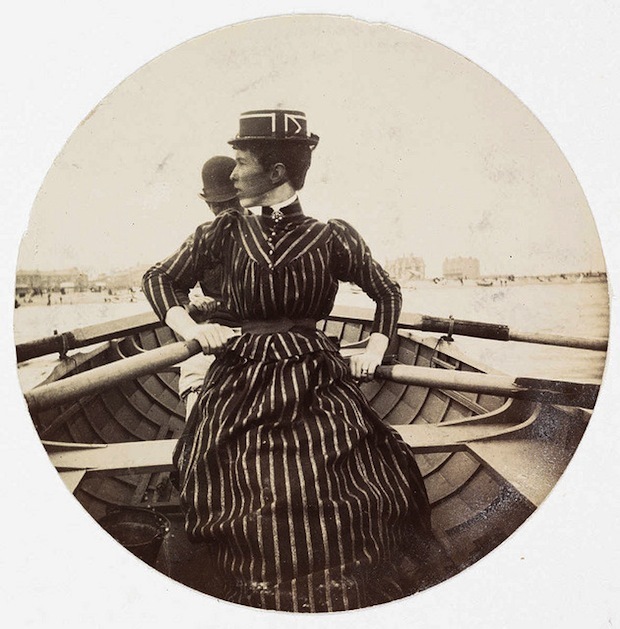 Eastman’s initial entry into the photography world had introduced him to the complexities and physical burdens the early technology entailed; toxic chemicals, heavy equipment, short working times, and a need to technically master these challenges. As a result, his entrepreneurial efforts were fueled by a compulsion to continually improve the science of photography, to make it easier for the common man to employ, and to broaden its appeal, “to make the camera as convenient as the pencil.” This compulsion, combined with the technical contributions of his associates and competitors, led to photographic innovations that still serve us today. While dry plate technology was a vast improvement in convenience and performance over the wet collodion process, sensitized glass dry plates were still bulky, relatively heavy, and breakage prone, and therefore inconvenient for photographers in the field. The search was on for a tough, flexible, waterproof and chemically impervious optically transparent support material for light-sensitive emulsion that addressed these deficiencies. In the mid-19th century, a promising new material was developed that promised to address these needs – celluloid. Between 1855 and 1873, Englishman Alexander Parkes and Americans John and Isaiah Hyatt spearheaded the development of what came to be known as celluloid, using a mixture of oils and gums, and eventually camphor, as a solvent for nitrocellulose, seeing it initially as a substitute for ivory in such applications as dominoes and billiard balls. John Carbutt, an Englishman who emigrated to the United States and worked as a professional photographer, saw potential in 1888 in the products of the Hyatt’s Celluloid Manufacturing Company; the Hyatt brothers had patented procedures to manufacture large clear blocks of celluloid, and a slicing machine that could produce uniform sheets of celluloid as thin as 0.01 inches. In Carbutt’s innovation, these sheets were then pressed between heated metal plates to remove the slicing marks. The sheets could then be coated with light-sensitive gelatin emulsions similar to that used with glass dry plates. This resulted in thin, light, tough and moderately flexible substitutes for heavy, brittle glass plates. As much as this was appreciated at the time, these celluloid films were still too thick to be readily rolled. The concept of rolls of light-sensitive emulsion in a camera had been around for years by this point; in 1854 Talbot’s calotype paper-based negatives were gummed together and wound on rollers in the first roll film device patented by J.B. Spencer and A.J. Melhuish. In 1875 L.Warnecke developed a 100-exposure roll film device employing paper with dry collodion emulsion. These devices suffered from the combined effects of immature emulsion technologies and inadequate engineering. When George Eastman teamed up with William Walker to develop a roll film device, the result was a great photographic leap forward. Patented in 1885, the Eastman-Walker Roll Holder employed interchangeable parts, making mass production possible. The device featured paper-based gelatin emulsion film wound around a wooden spool, stretched across a flat plate to a take-up spool; this assembly was fitted inside a wooden case which attached to the back of a camera in place of the normal glass-plate holder. Winning gold medals at exhibitions in London and Paris, the roll film holder permitted photographers to increase their production from two or three images an hour to 50 images per hour, all in a device that weighed just 2.75 pounds loaded. As well received as the new roll film holder was, the photographic community was less enthralled with the quality of the film Eastman offered with it. The paper-based film, even though made translucent via oiling, still suffered from the image softening effects seen in the earlier calotype negatives. Professional photographers used to the sharpness of daguerreotypes, wet collodion, and dry glass plate processes would not accept the inferior results of this paper-based film. Faced with rejection by the professional photographers, Eastman took a marketing turn that was both unexpected and providential. Instead of trying to develop a product for the elite photographer of the day, Eastman saw the need for an easy to use camera that any man or woman on the street could own and enjoy. 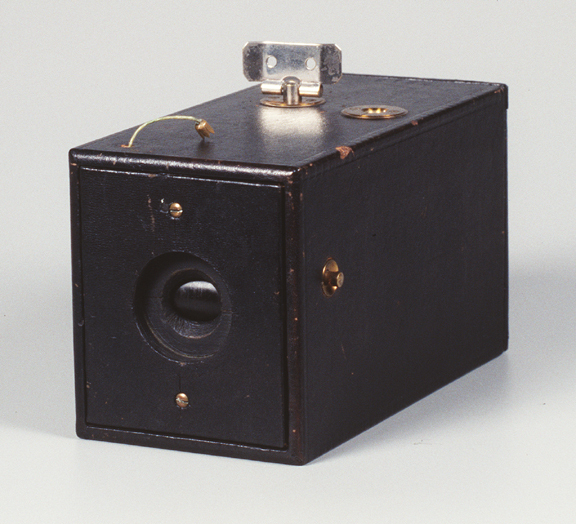 He developed a new camera, essentially a simple leather-covered wooden box, featuring a fixed focus lens (manufactured by newly immigrated German lens makers Bausch and Lomb), a fixed aperture equivalent to f/9, and a single shutter speed of 1/25 sec. Most importantly, the camera came preloaded with a 100-exposure rolled film. The camera was simplicity in operation as well; one wound a key to advance the film (4 clicks per frame), armed the shutter by pulling a cord, and then released the shutter by pressing a button on the side. There was no viewfinder – you simply pointed the camera in the general direction of the desired image to take a “snapshot.” The camera was also accessible cost-wise to the masses, priced at $25 when it was introduced in 1888 (about $610 in current dollars). Most importantly, there were no darkroom tasks for the fledgling photographer. After taking 100 exposures, one shipped the camera back to Rochester where Eastman employees would open the camera, develop the film and print the 2-1/2 inch diameter round images (designed primarily to compensate for the poor image quality offered by the lens in the image corners), reload the camera with a fresh roll of film, and then return the lot to the buyer, for a processing cost of $10 ($244 today). This camera was the original Kodak, marketed under the famous slogan, “You Press the Button, We Do the Rest.” (Eastman and his mother coined the name “Kodak” for the camera using his favorite letter ‘K’, ensuring the word was short, distinctive, and pronounceable in any language, and was completely original and had no prior meaning, so that its use could only refer to their product.) 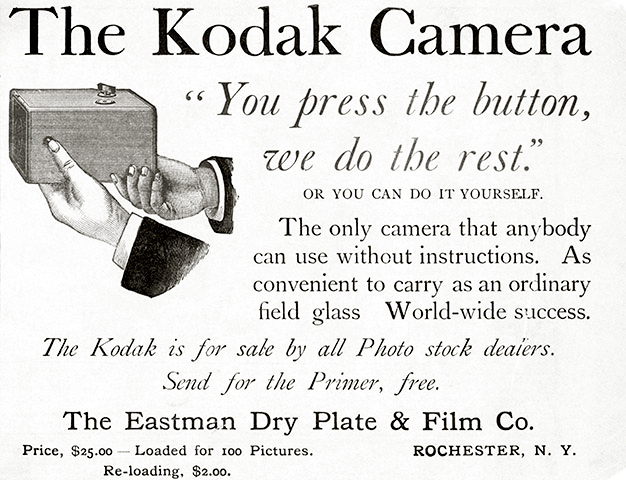 So successful was the Kodak camera in popularizing photography for everyday users, and in cementing the Eastman Company’s reputation as a photography powerhouse, that in 1892 the company’s name was changed to the Eastman Kodak Company. Because the earlier “negative paper” roll film had not been especially welcomed due to its inherent image quality limitations, Eastman introduced an improved roll film in 1885, called “American stripping film.” The stripping film consisted of the silver-gelatin emulsion applied over a water-soluble gelatin layer, in turn applied to a paper base strip offering 100 exposure frames. When the exposed film was returned to the Eastman factory for processing, the film was first steamed to dissolve the soluble layer, and the emulsion layer was then transferred to a clear gelatin or glass base for further development and processing. These stripping films, despite the additional processing steps, provided superior image quality over paper negatives and were the preferred roll film type until supplanted by an even better improvement. In 1887, after 20 years as a parish rector, Hannibal Goodwin of Newark, New Jersey, applied for a patent for a celluloid-based roll film process he had developed in private experimentation as an amateur photographer. Due to vague wording in the patent, it would not be granted until 1898. 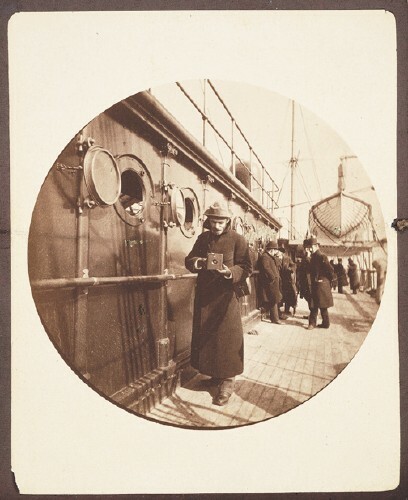 In parallel with Goodwin, George Eastman was well aware of the limitations of paper negatives, as well as stripping films, and was actively pursuing improved methods with his research chemist, Henry Reichenbach, as early as 1884. Early in 1888, Eastman and Reichenbach began actively considering celluloid as a roll film base, and by April 1889 had filed patent applications on what they saw as a quantum leap in roll film technology – production of the new transparent base nitrocellulose film began in earnest in August 1889. Soon the photographic world was abuzz with the prospect of a light, thin, rollable film that possessed the transparent qualities of glass, was processed with the same chemicals, required no stripping or other special processes, and yielded image quality comparable to glass plate negatives. The film was available in roll size to fit virtually every size camera, as well as in sheet form, and at affordable prices. The demand was so great for the new film that English and French manufacturing plants had to be built to supplement the Rochester-based facilities. While beyond the scope of this article, this development of celluloid film is what made practical the development of motion picture photography, which in turn ensured a huge demand for film production for the next 100 years. In 1900, Hannibal Goodwin finally established his own celluloid film production company, but he was unfortunately injured in a streetcar accident and died from his injuries before production commenced. Anthony and Scovill (Ansco) purchased Goodwin’s patent after his death, and then sued Eastman Kodak for patent infringement in 1902. This lawsuit dragged out in court for over 10 years, finally resulting in a ruling in 1913 against Kodak, “not on the ground that Eastman had copied the process, but that Eastman’s process, though an improvement, came within the Goodwin patent claims.” The court awarded Ansco $5 million, a paltry amount considering the profits Kodak had earned through celluloid film sales in the intervening years. 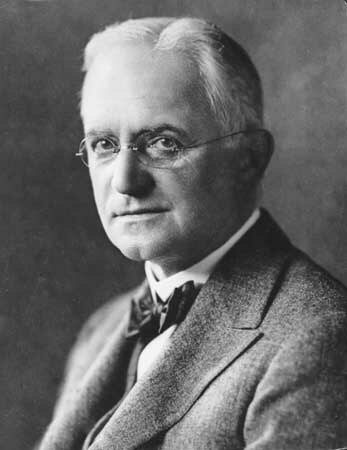 In 1900, the U.S. was in mild recession, Kodak was experiencing a sales decline, and George Eastman sought a remedy. While the Kodak (and improved Kodak No.1, No.2, etc.) camera had popularized amateur “snapshot” photography upon its 1888 introduction, its cost was still beyond the means of many average buyers. Eastman realized this and again recognized a unique marketing strategy. He reasoned that if a simple and cheap camera could be affordably made, cheap enough for even children to own and use, he would be securing a future market of camera and film buyers. The concept also paralleled the shaving razor marketing model, where the initial purchase cost (the razor holder, or camera) was low, but the cost of the consumable (the razor blade, or film) was relatively high. The outcome of this strategy was the cardboard and wood Brownie camera, introduced in 1900 for a price of $1.00 ($28 in current dollars), featuring 6-exposure rolls of 2-1/4 inch square 117 size film, selling for 15 cents each ($4 today). 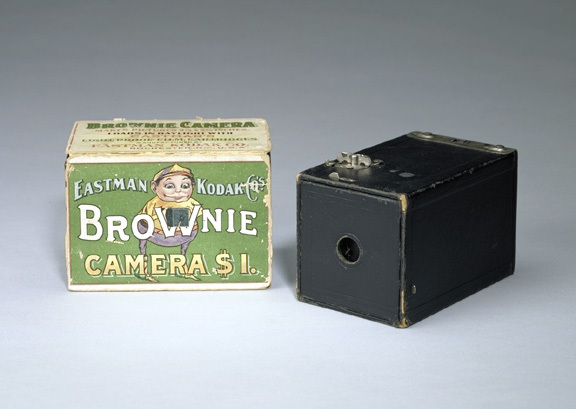 150,000 Brownie cameras were manufactured and sold in their first year, supported by a huge advertising campaign that capitalized on the popularity of the “Brownie” series of children’s cartoon books. For 80 years, the Kodak Brownie name lived on through almost 100 camera models, epitomizing popular photography for the everyman, and introducing generations of future photographers to the art of photography – how many reading this today can still fondly remember their first experience with photography behind a Brownie? This is the sixth installment of an ongoing series on the history and development of the art of photography. It is inspired by the History of Photography class taught by Professor Jeff Curto in the College of DuPage Photography Program. While not a slavish copy of his work, I freely admit to following his general course outline and sharing many of the perspectives he has developed. I would encourage anyone with a greater interest in this subject to follow his course online via video podcasts, at http://photohistory.jeffcurto.com. Tenho uma Cametá destas da caxotinho de madeira revestido de couro.Era do meu avô, que a comprou pra sua lua de mel. Nunca soube o ano de fabricação dela,agora sei ,1888!!!! !